Bill Viola, born in 1951, comments �I don’t like the label �video artist.�� He describes himself as an artist who �happens to use video because I live in the last part of the twentieth century.� It is helpful to keep this in mind when encountering Viola�s work because video is often associated more with action than it is with atmosphere, image, and sound. The latter are the defining qualities of his videos and video installations. He is living into the twenty-first century and video technique and art continue to develop, but Viola uses video to convey both the two-dimensionality of traditional art and the movement-in-stillness of sculpture. What video adds are the elements of sound and commentary in the context of the imagery. Those who have seen his work have their favorites and mine – from the 1999 San Francisco Museum of Modern Art (SFMoMA) exhibit – is �Slowly Turning Narrative� (1992), which I think of as �the one who� from the soundtrack�s repetition of those three words followed by words such as rages, defends, stands by, wishes, trusts, withholds. Perhaps as a Zen Buddhist I was particularly struck by this installation since the self, or more specifically the narcissistic self, is the focus of the deconstructive meditation and ethics of Buddhism. In Buddhist teaching, it is the narcissistic self that causes suffering for oneself and others. �The one who� can be self-absorbed and experience the world as a reflection rather than interconnected to itself. �Slowly Turning Narrative� includes a revolving mirror along with images of people in ordinary scenes, and various sounds along with the chanting voice. I found it both engaging and eerie, and my experiential memory is of bright light, both internal and external, as well as image and sound. The SFMoMA exhibit included an interactive feature online that can be accessed from Viola�s web site or through this direct link. The video installations are described and the soundtracks are included. The observer of art has to slow down and allow their senses to be more interactive than is usually possible. This includes a type of solitude-among-others that video is particularly able to foster. In a review of Viola�s �The Passion,� Fernando Castro commented: �Bill Viola has realized that the recording of events of our daily context reveals experiences that are universal, deep and mysterious, leaving a metaphor similar to abandoned mathematical equations without solutions.� A degree of surrender is necessary in order to view and experience his work from this perspective. 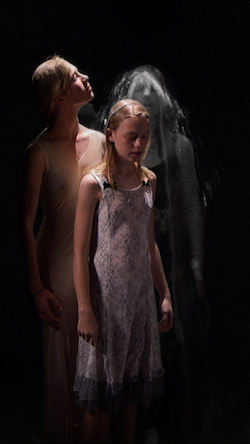 BILL VIOLA, �Three Women� (video still), 2008. Photo: Kira Perov. 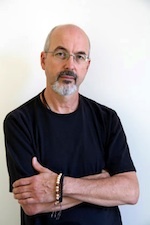 The final event of SF Zen Center�s “Zen Center 50” series of events is an evening with Bill Viola at the First Unitarian Universalist Church of San Francisco, on Friday, November 9, 7:30pm. The evening, entitled �Bill Viola: Transformation from Within,� includes a conversation with art historian John Walsh, who was curator for Viola�s exhibitions at the Getty and the National Gallery in London. For Viola, the sublime is more often than not a way of using darkness and monumentality, repulsive imagery, and terrifying bursts of sound and light to jar the viewer into meditation on something the artist finds genuinely enthralling: the human condition � Bodies, communion, suffering, transcendence, and death collectively constitute a condition, a worldview that the artist seeks to investigate in his work. Whether one is Buddhist or Christian or atheist (of the Camus variety), coming to terms with suffering and fear and our inability to communicate these states adequately presumes an understanding of the human condition, and Viola finds video a powerful artistic means of exploring these existential facts. Tickets can be purchased online or by calling� 888-743-9362 (toll free) or 415-475-9362. *The reception following Transformation from Within, limited to 30 attendees, will be held at the San Francisco home of contemporary art collectors Pamela and Richard Kramlich in Presidio Heights. Proceeds from this event will benefit the development of our fourth �virtual� online practice center as part of the�Widening the Circle Capital Campaign.